The network, called 48, will be low-cost but only for people aged 18-22. THE PARENT COMPANY of O2 has introduced a new low-cost mobile network. The catch? Only young people are allowed to sign up. For €10 a month, it offers unlimited calls and texts to any mobile network, as well as 20 minutes to landlines. 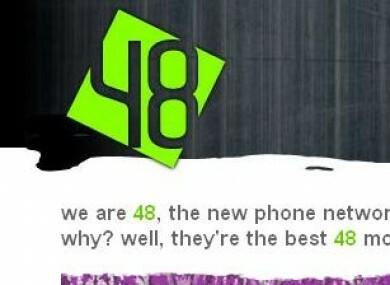 “Landlines are for losers,” as the 48 website declares. There’s a small additional charge for 3G internet use. The company – run by Telefonica Digital, which also owns O2 – will piggyback on the existing O2 network, and will exist only as an online store. The new company 48 told TheJournal.ie that it is a stand alone operator and “is entirely separate from O2 Ireland and operates independently to the O2 business in Ireland”. Email “Introducing a new mobile network... for young people only”. Feedback on “Introducing a new mobile network... for young people only”.